Google teased a new night mode feature, dubbed Night Sight, during the launch of the Pixel 3 (Review), which promised seemingly huge improvements in low-light photo quality. Now, the company is officially rolling out this feature for its entire range of Pixel smartphones. 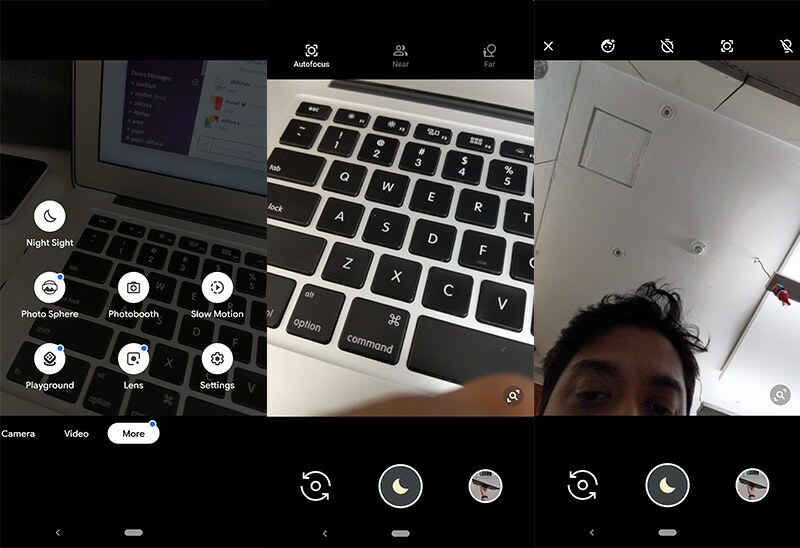 Unofficially, Night Sight has been out in the wild for a few weeks, and a member of the XDA Developer forums managed to modify Google’s Camera app to enable it on any Pixel smartphone. Since then, we’ve also had ports for the OnePlus 6 (Review) and OnePlus 6T (Review) and just recently, we also got ports for Xiaomi’s Poco F1 (Review) as well as Xiaomi Mi 8. In this article, we’ll be taking a deep dive into how Night Sight works, what the results look like, and how you can get it on your Google Pixel smartphone. 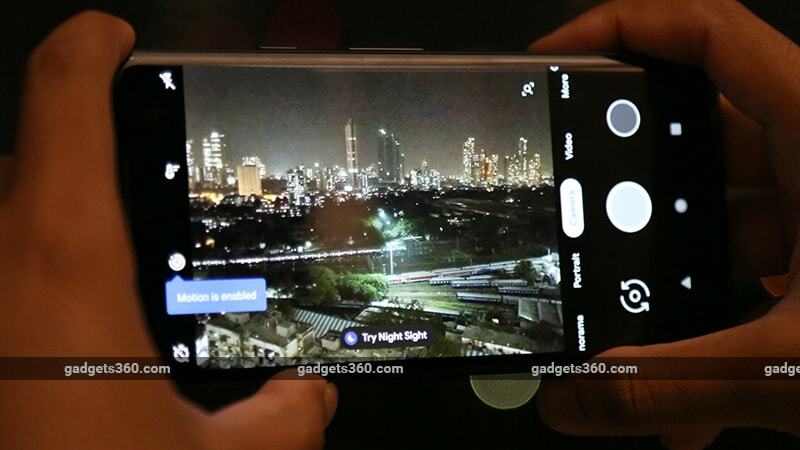 What Is Night Sight and how does it work? The main goal of the Night Sight shooting mode is to reduce noise and improve details in images shot in dark environments. In traditional photography, the simplest way to achieve this is by using a slower shutter so the image sensor can take in more light. However, without a tripod, motion blur can become a big problem if you (or even the subject) move(s) even slightly. This technique on a smartphone can yield disastrous results, since these are almost always used handheld. When you see Night Sight in action, it seems like pure wizardry. In reality, it works on the basis of computational photography and some machine learning. According to a Google blog post, the main challenge the company faced was getting the alignment of all the objects in a frame right, since Night Sight essentially using a frame-averaging technique, much like HDR+ and Super Res Zoom. 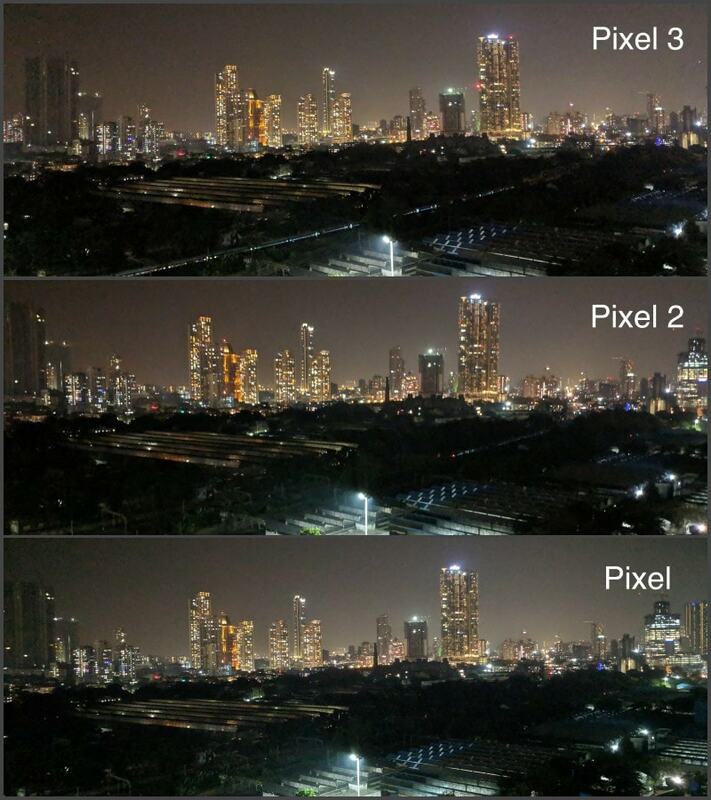 The Pixel and the Pixel 2 use a modified version of the HDR+ algorithm for Night Sight, while the Pixel 3 uses a tweaked version of the new Super Res Zoom algorithm to deliver similar results. From the moment you press the shutter button in Night Sight mode, the camera captures a series of frames in quick succession. The number of frames captured really depends on the amount of available light and whether you’re using the phone handheld or on a tripod. It could be anywhere from 6 to 15 frames. 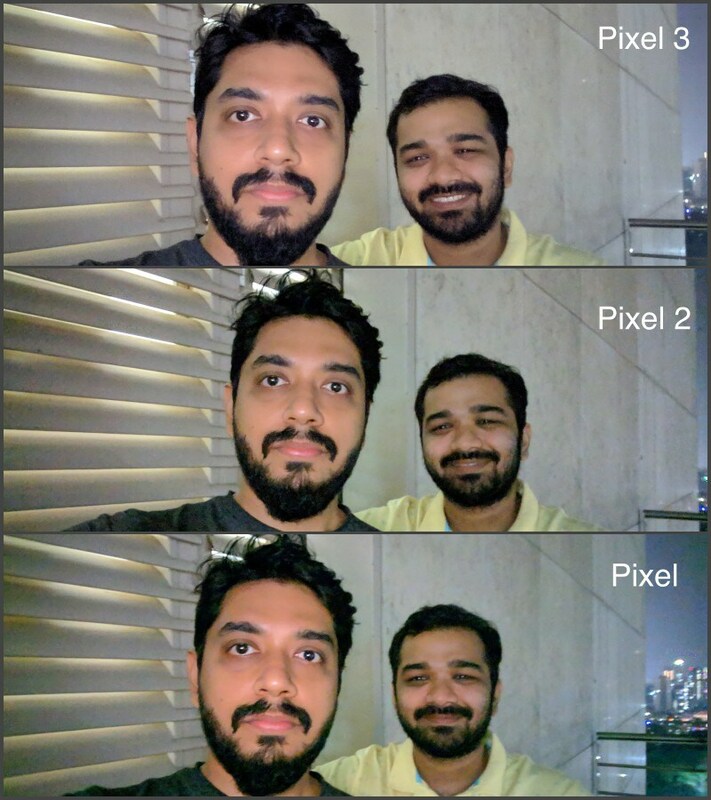 The Pixel 3 and the Pixel 2 (Review) have the advantage of being able to handle longer exposures per frame, since they have optical stabilisation (OIS) to compensate for shakes, but the original Pixel resorts to shorter exposures since it lacks OIS. A couple of things worth pointing out at this stage — it takes a few seconds for the camera to finish capturing all the frames, during which period, you will need to be still. If you move, or your subject moves, those frames are either discarded or your subject might have slight motion blur in the final picture. Once a picture is saved, it undergoes some more processing in the background to correct the white balance and exposure level. 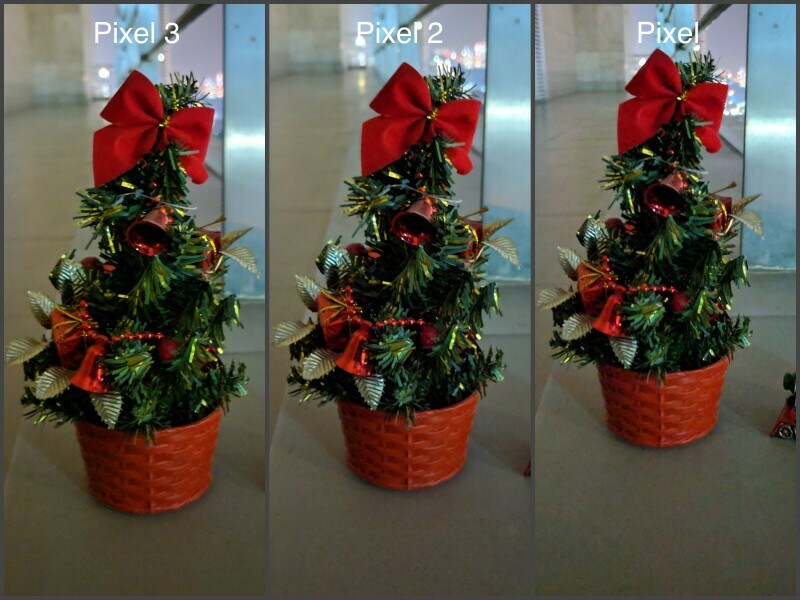 Google says it has developed a special deep learning-based auto white-balance algorithm, which was trained on a Pixel 3. 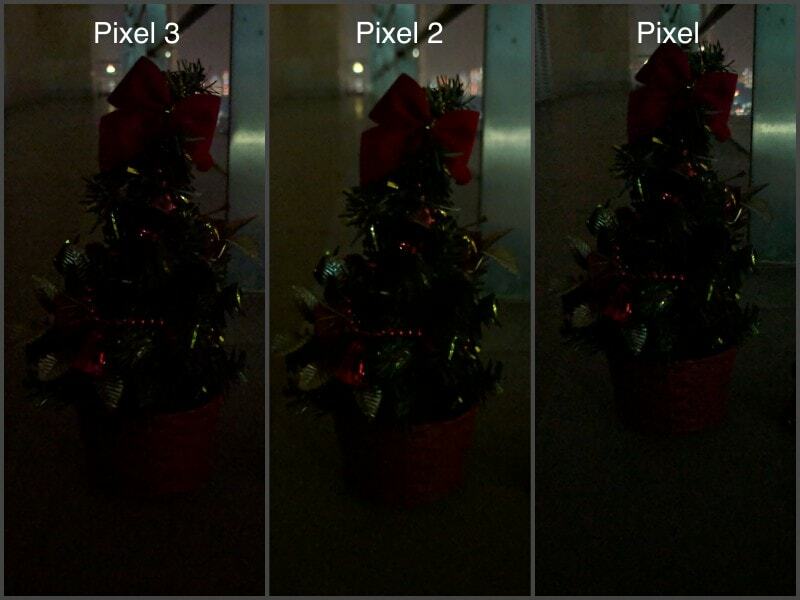 This is why when you compare images taken with Night Sight on all phones, the images from the Pixel 3 typically have better white balance. Google itself admits that this algorithm will deliver the best results on a Pixel 3. The company has also tweaked its tone mapping techniques to strike the right balance between giving you a well-lit image and staying true to the actual time of day. How to get Night Sight right now — and does it really make a difference? If you own any Pixel smartphone, you should soon see an update for the Google Camera app waiting in the Play Store. If it isn’t there yet, be a little patient, as Google is rolling this update out in phases, so you should get it eventually. Once your Google Camera app is updated, open it and go to the More tab, which is where you’ll see Night Sight. If you’re shooting in Auto mode and your surroundings are very dim, you’ll see a little prompt in the viewfinder to Try Night Sight. Shooting photos is pretty straightforward. All you do is point the camera at your subject, press the shutter button and hold still till the process is done. You can — if you want — set a timer for three or 10 seconds to initiate a countdown to the shot, and exclusive to the Pixel 3 series is the ability to manually set the focus. The latter feature is only needed if you’re shooting in pitch darkness and the camera isn’t able to lock focus. ‘Near’ forces the camera to focus at around 1.22m, while ‘Far’ focuses at 3.66m and beyond. 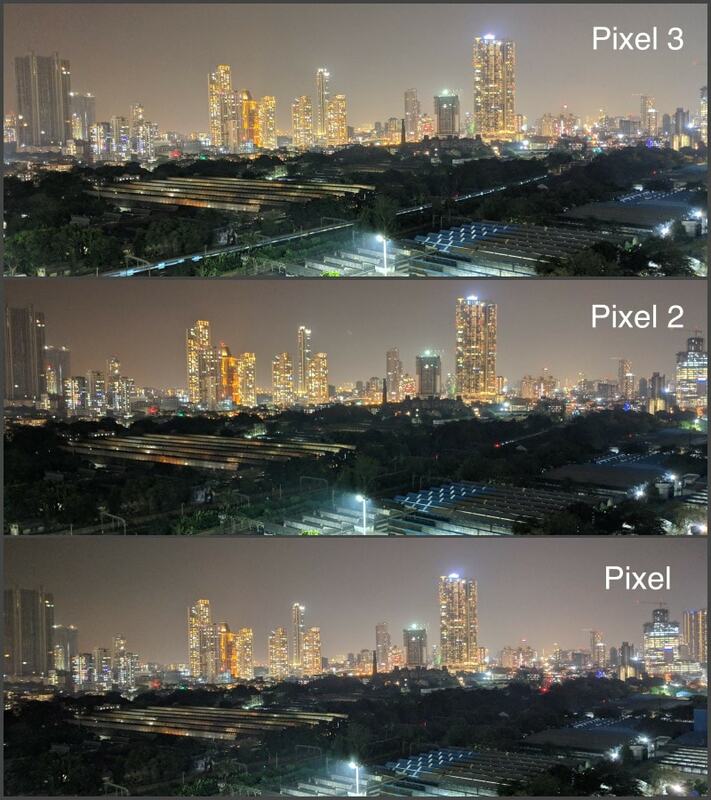 For our landscape test shots, we first tried a Google Pixel 3 XL, Pixel 2 XL, and original Pixel with a decent amount of light around. All three generations of phones did a decent job with detail, but there was still quite a bit of visible noise in the sky, and the objects in the shadows were not clearly visible. With Night Sight, noise was reduced drastically, giving us much cleaner images. The colours and details in distant objects were also much better defined, and we could see a lot more in the shadows. In our our close-up test results, you can see that our subject was barely visible when shooting in auto mode. In fact, that’s pretty much what we were seeing with our naked eyes. But with Night Sight, it’s like someone switched on the lights. The colours, detail and clarity of the images improved drastically, with excellent focus and background blur too. 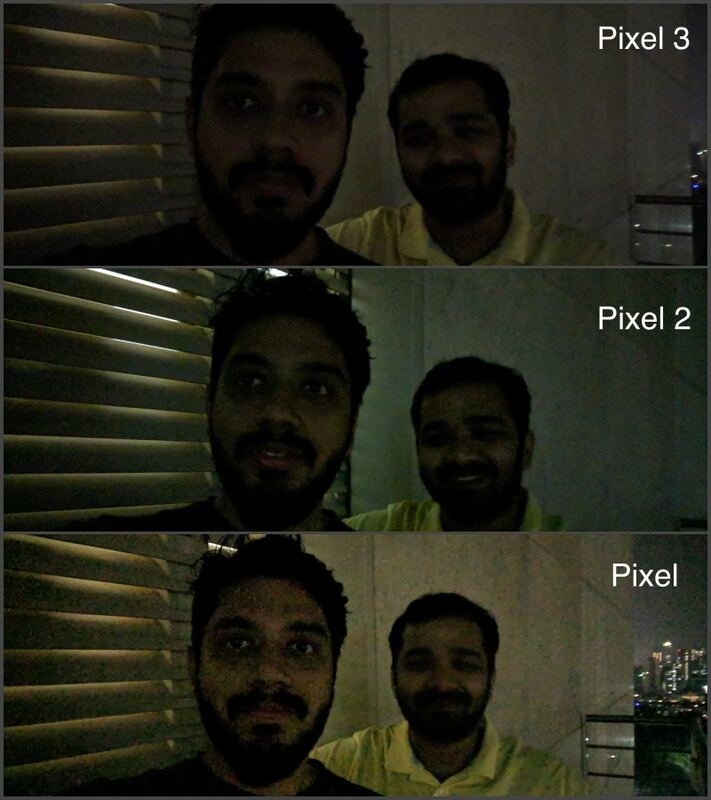 Night Sight also works for the Pixel phones’ selfie cameras. Here, you can also enable fill lighting if it’s too dark to shoot. For this test, we were standing in near-total darkness, with the only illumination coming from the lights on buildings opposite us and a bit from the door behind us. As expected, none of the phones were able to capture anything worth sharing when used in Auto mode, but with Night Sight, the difference was massive. The image quality got even better when we enabled fill lighting for Night Sight. Based on what we’ve seen so far, Night Sight seems to a game changer, and it pretty much kills the need for an LED flash on your phone for photography in many situations. There are a few limitations to this feature, for example, it isn’t very effective in pitch darkness, and it’s best used on still subjects. It’s nice to see Google adding this feature to its older Pixel phones too, but what we’d really have liked is for the company to open it up for OEMs to incorporate in their own camera apps. It’s been done with Google Lens and AR Stickers, so why not Night Sight?